Is a fun annual summer event all about health and wellness. This free community event takes place in the Community Green Space park located at the corner of Harbour Way and Macdonald Avenue. 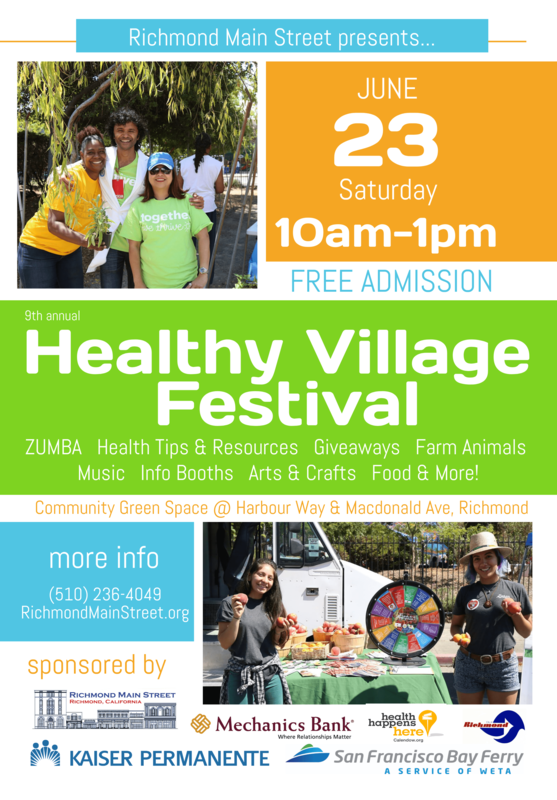 Richmond Main Street collaborates with local community groups and nonprofits, caterers, and businesses to provide delicious healthy food samples, recipes, cookbooks, fresh produce giveaways, educational and fun activities for kids, and access to information about living a healthier lifestyle. Family-friendly. Free Admission. All are Welcome! Hang out with Richmond Fire Fighters! Huge thanks to 25 resource, artisan & food vendors! This year 19 individuals helped us bring this event to life! Thank You to Our Healthy Village Festival 2018 Sponsors!